Claire dreams of being a renowned artist, but for now the entirety of her art sales come from her Reproductions.com commissions, where she paints copies of famous paintings for the moderately wealthy – OTC (over the couch) paintings, as she calls them. It wasn’t always this way. Three years ago, Claire was a promising young art student. The problem came when she had an affair with her mentor, Isaac. After what happened with Isaac and his art, Claire was shunned despite her talent, which is why she is now stuck with Reproductions.com. 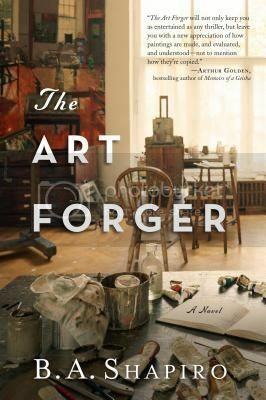 When Aiden Markel, Isaac’s old art dealer, comes calling, Claire lets herself hope that her talent has finally won out, that the small, insular art world is beginning to forget about Isaac. Instead, it turns out that Markel is coming to see Claire partly because of her ostracism, and partly for the skills she has developed as a copyist for Reproductions.com. In short, Markel is asking her to forge a Degas. Not just any Degas, either, but one of the painting that went missing during the Gardner Heist some twenty years earlier. The Art Forger is just fabulous. FABULOUS I TELL YOU. Although most of the action happens in the present when Claire is involved in this forgery – after being convinced by Markel that if she forges the painting they will be able to return the original to the Isabelle Stuart Gardner museum – we also see flashbacks to the time of Claire’s falling out with the art world, as well as letters from Isabelle Stuart Gardner to her niece as she went about Europe collecting artwork. All three sections are pieced together beautifully so that they inform and enhance the story as a whole. Claire’s mental state is particularly well developed. Although committing forgery is clearly Not A Good Idea, it is easy to understand how she allows herself to be talked into it. In fact, the motivations of all of the characters are very well drawn. Even Isabelle’s letters give sufficient information to explain her actions, while still managing to read like authentic letters. In addition to the great writing and plotting, many readers are going to absolutely adore Shapiro’s depth of detail on painting in general and aging paintings as is done by forgers in particular. Even if you are not an art fan, this level of detail gives The Art Forger a level of reality that helps the reader live securely in Claire’s head, making the story all the more engaging. Wonderful story wonderfully told. Very highly recommended. After reading your review I have to add this one to my TBR list! I love books about art and the premise to this is fantastic. I received this in the mail recently and I can’t wait to get to it. My stacks are getting a bit crazy, lol. This one deserves to go right to the top! Can’t wait to get my hands on this!! I had seen this one and glad you reviewed it. Good to know! Art and the story behind it sounds so good. I SO want to read this now, although when I first read the synopsis, it didn’t grab me. This is the second book in the last month or so I’ve done that. I hate that. The synopsis sounded interesting enough for me to pick it up, but it wasn’t like I was just dying to read it. Then I picked it up and didn’t want to put it back down. Your review makes me want to read this now, but unfortunately I have to wait my turn at the library, LOL. It does sound fabulous. This is not one I had heard about before, but you make it sound so good! This book sounds really cool!!!! I haven’t heard of it before, but I will have to add it to my to-read list! Completely agree- one of my favorite books this fall. It had all the elements for success- intrigue, drama and romance. Plus, I loved learning about everything that went into copying a painting. Thoroughly enjoyed and have recommended to everyone I know. I am so interested in this book. I recently reading Stealing Rembrandts about famous Rembrandt art heists – the author is the head of security at the Isabella Stuart Gardner museum and I have been fascinated by the heist that happened there. Thanks for this review – I love how the art heist connects to this book as well.